Today, like most days on this trip, started out with picturesque weather and bright blue skies. It’s hard to put the camera away and walk. Every direction is full of clouds, glaciers, mountains…it’s easy to see why this trip has been on my bucket list. 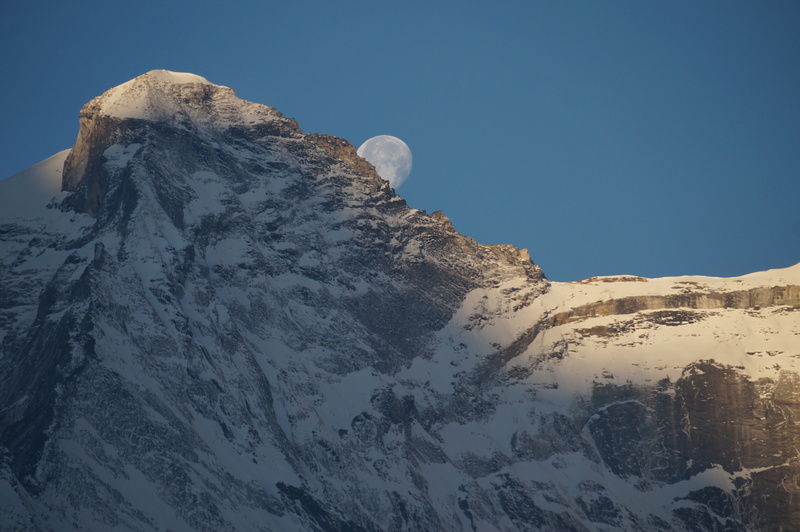 Before the moon has set we are off toward Pheriche and on to Lobuche. It turned out that the extra acclimatization day was a good call. 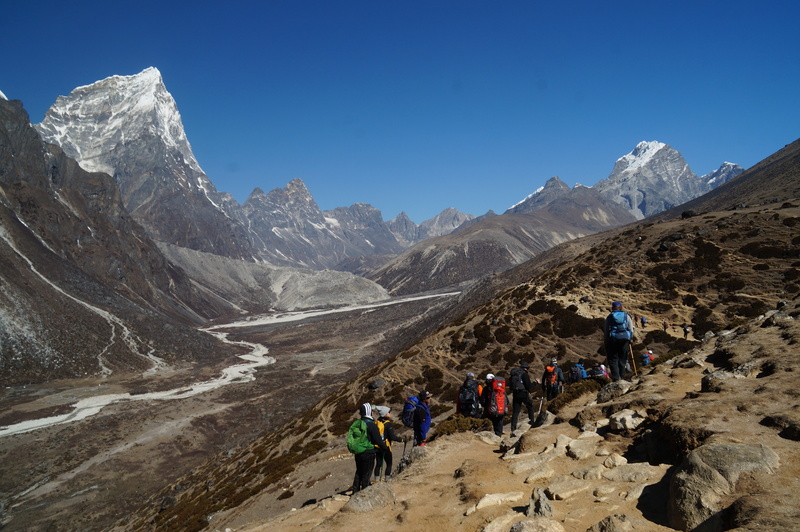 The walk was largely a combination of low grade up with Nepali flat, and once I warmed up and hit my stride I started blasting past the large tour groups. 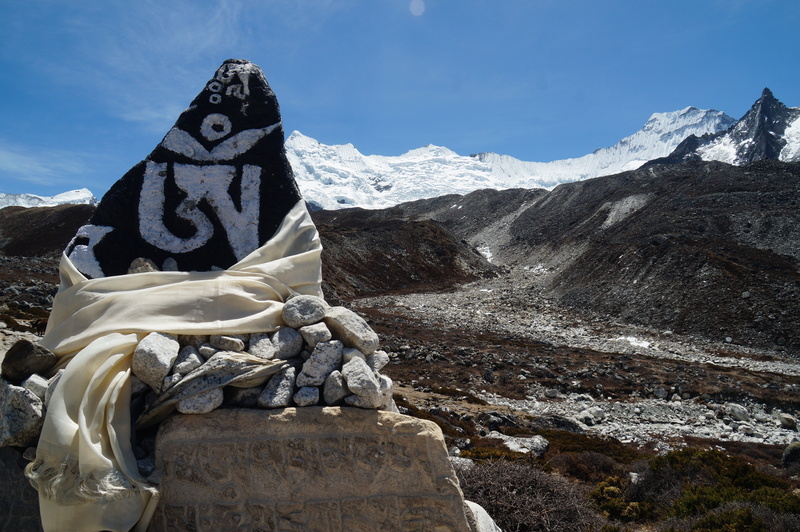 The most notable up put us at a memorial for climbers (both sherpa and foreign) who had lost their lives on Everest. As you climb to the top of the hill you’re presented with a gate made of prayer flags. Beyond the arch lie a number of stone memorials. The larger and more decorated memorials belong to foreign climbers. 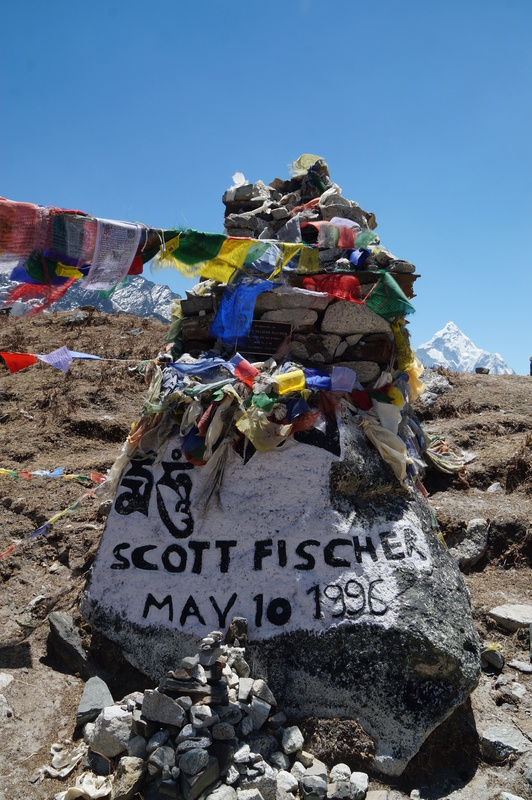 Scott Fischer, who died in the 1996 Everest tragedy depicted in Into Thin Air was the most prominent. The sherpa memorials were more subdued. It was sobering, especially knowing that it needed 17 or more memorials. The rest of the walk was pretty straightforward and uneventful, yet full of increasingly scenic vistas. 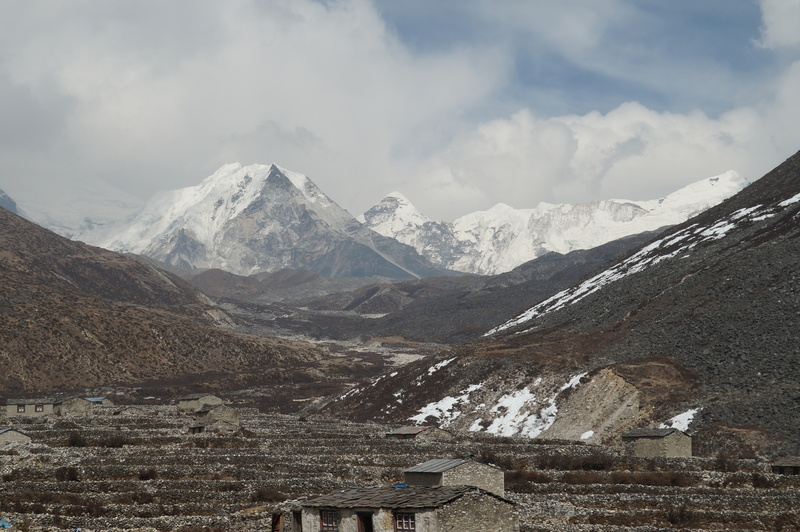 We had finally entered the Khumbu Valley. It’s hard to tell there is a glacier under all the debris – it looks more like a giant rock tongue sliding down the valley floor. 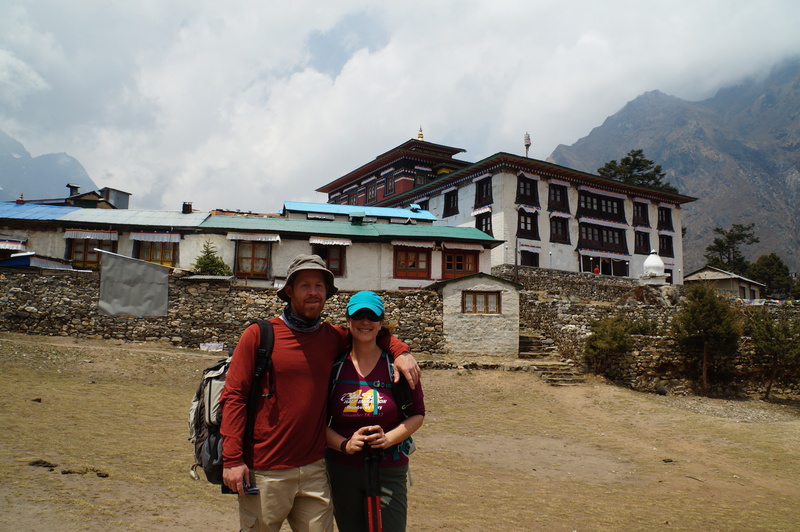 Eventually we were settled in Lobuche for the night. It was time for rest. 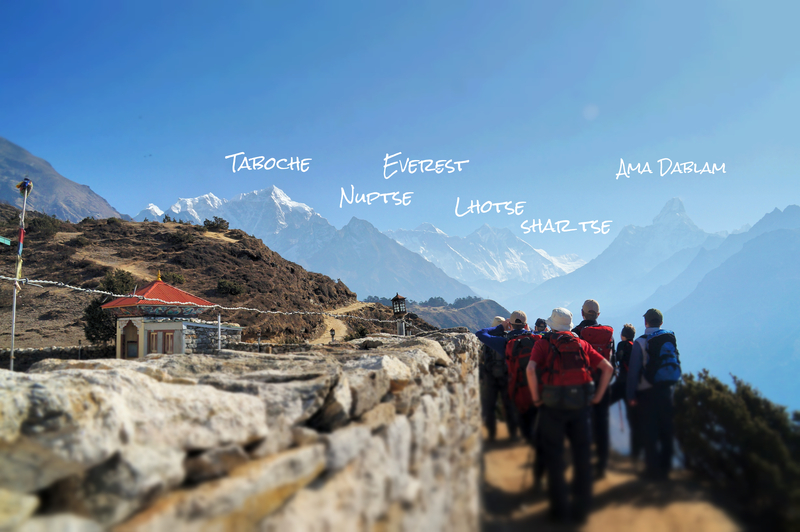 Tomorrow: Everest Base Camp – the day we have all been waiting for! I took a second diamox at sunrise, and within 20 minutes I could stand up without my head throbbing. I didn’t feel great, but I was improving. 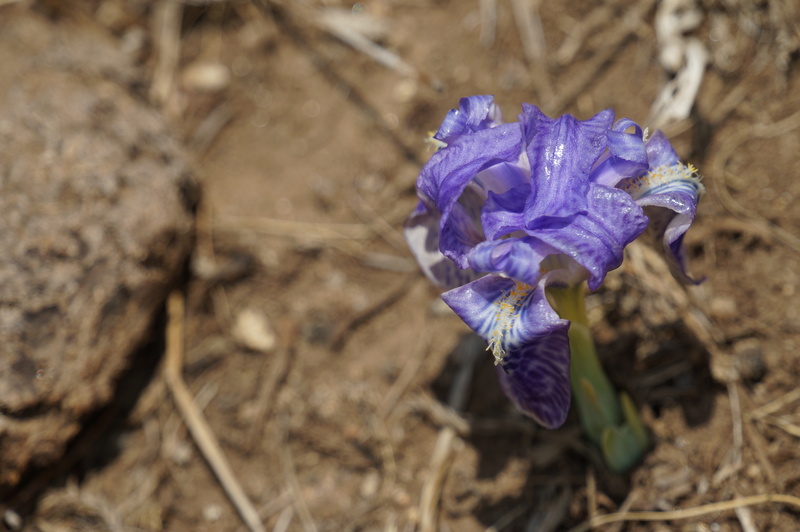 One thing was certain though – I needed an extra acclimatization day. But the good news was that I didn’t need to descend and abort the rest of the trip! We decided to push our flights back one day and keep the rest of our itinerary as is. 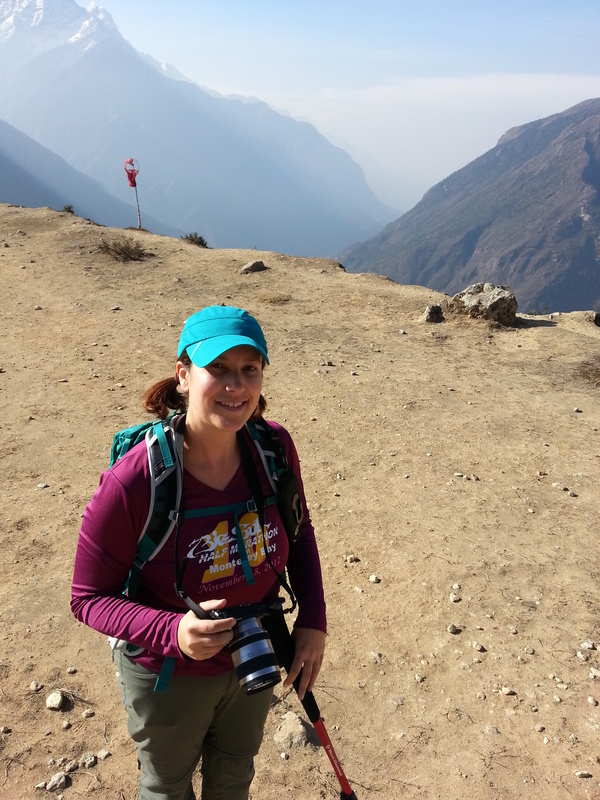 We also opted for a day hike to Chhukhung to climb a scenic overlook at 5000m. It was a long walk. I was slow at best, but it kept the headache at bay and that was all that mattered. And the views didn’t hurt. At every opportunity I used my slowness as an excuse to take pictures. 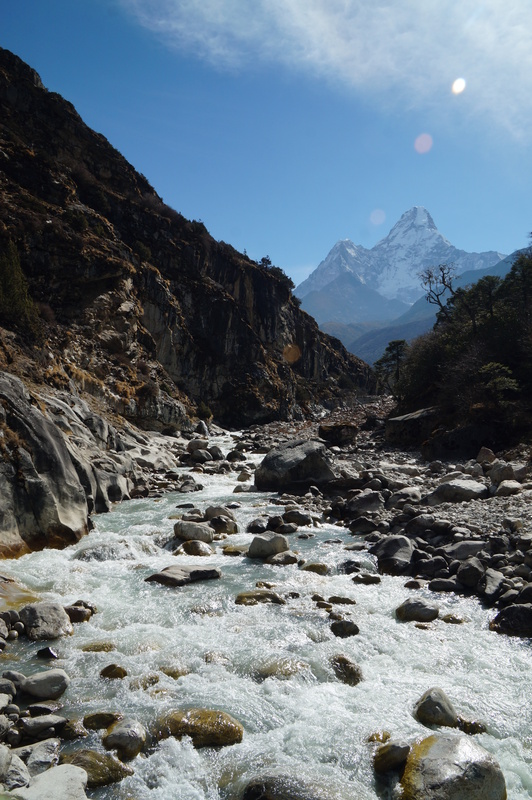 I couldn’t get enough of the sights, especially looking toward Ama Dablam, Amphu Gyabjen and the Chhukhung Glacier. 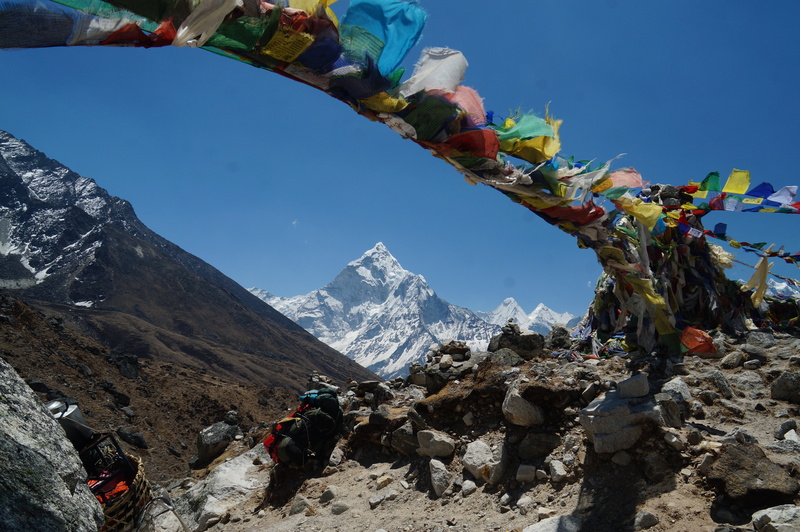 Every angle of Ama Dablam is photogenic! We stopped for lunch at Sunrise Eco Hotel. This is where Wes and Tom will stay en route to Island Peak. We snacked, chatted up folks who had just summited, and sorted out gear rentals for Wes and Tom. It sounds like the crevasses are quite a hazard this season. I tried not to think too much about how hard their climb would be. And I was certainly glad I had opted out! After our rest we set off for the scenic viewpoint on Chhukhung Ri – 500m below the summit, but with similarly nice views. 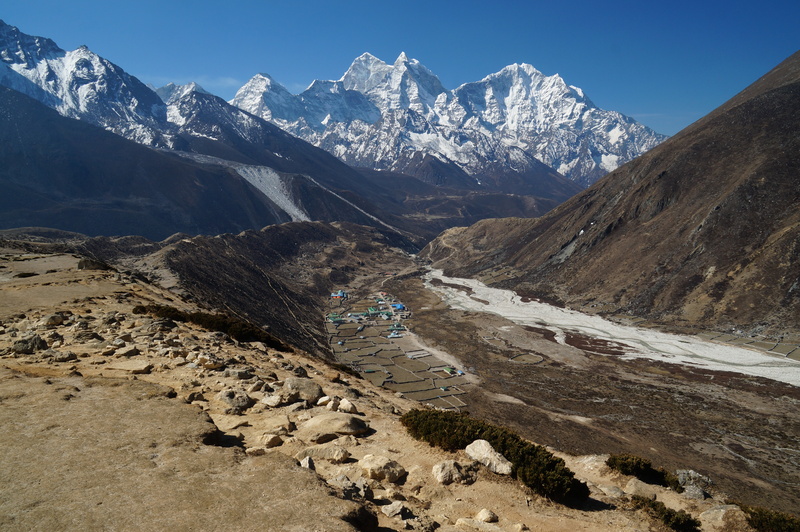 We were surrounded by Nuptse, Lhotse, Island Peak, the Ama Dablam complex, and the rest of the valley. I didn’t think I would make it, but I’m glad I did. Our overlook was higher than tomorrow night’s lodging, so I should be in good shape and AMS-free. 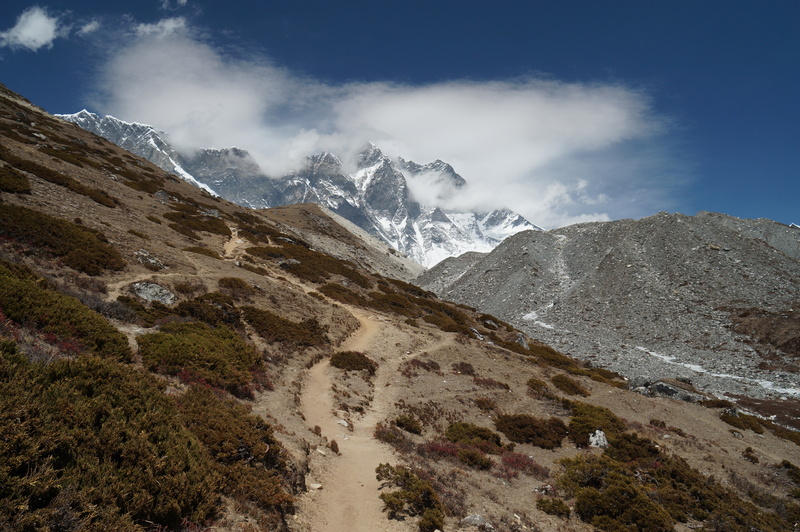 Still, the wind hammered us on top, and it was not long before we started the long downhill back to Dingboche. It was a long day, and 2 liters of water each did not turn out to be enough. We arrived at our lodge desperate for more water and to empty our bladders. It was Wes’s turn to have the dehydration headache, but after pounding a liter of water it subsided. We capped the day with our now mandatory dose of flour-free garlic soup and some dal bhat, while the Indian trekkers and sherpas in the dining room sang away the day. The avalanche tragedy continues to unfold: we learned that the Everest climbing sherpas’ wives were threatening to hang themselves if their husbands didn’t come home. With this news, it seems that the remaining supported climbs for the year are cancelled. I can’t say I blame them. Today was a rough day. It started out well enough, but the smoke and dust did my lungs in, and by our first tea stop I broke out my emergency inhaler. By our lunch stop the garlic soup turned my stomach. Things I was being terrible about apparently included eating a lot of wheat. The soup was thickened with flour. My stomach had finally rebelled from all the wheat poisoning. 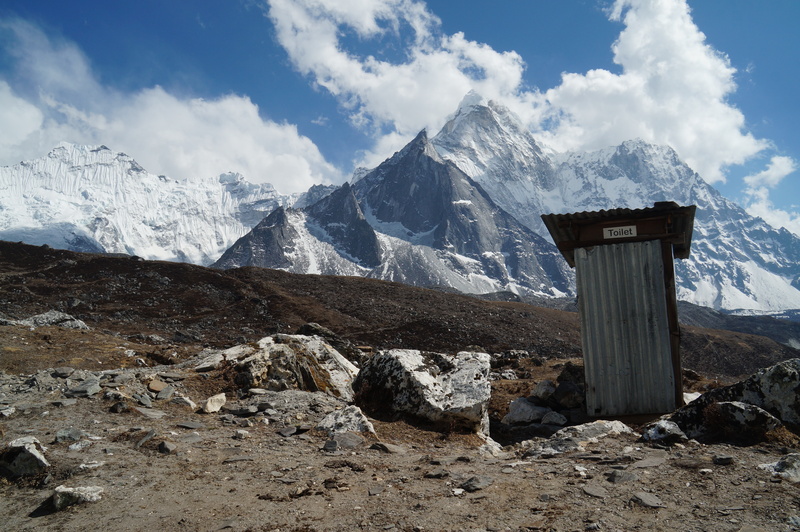 Needless to say, this made for a miserable climb to Dingboche, complete with an emergency rock stop. At least the views were gorgeous. 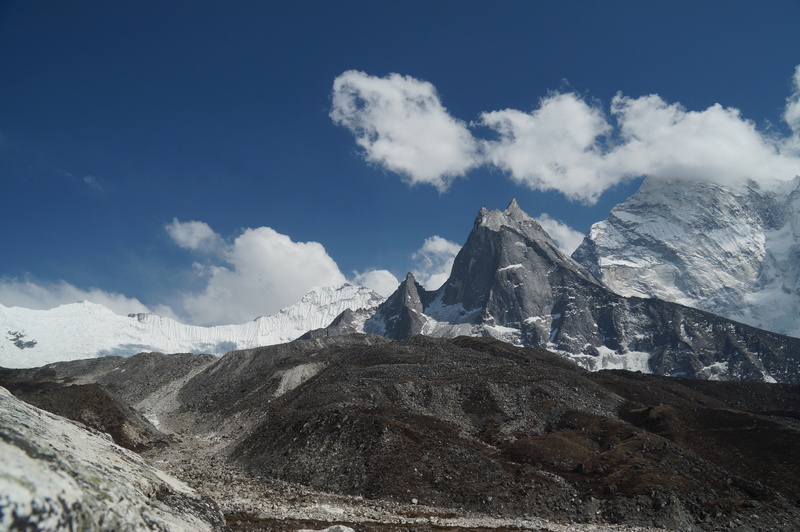 I couldn’t get enough of Ama Dablam (the 100+ pictures of the mountain in my collection are proof!). 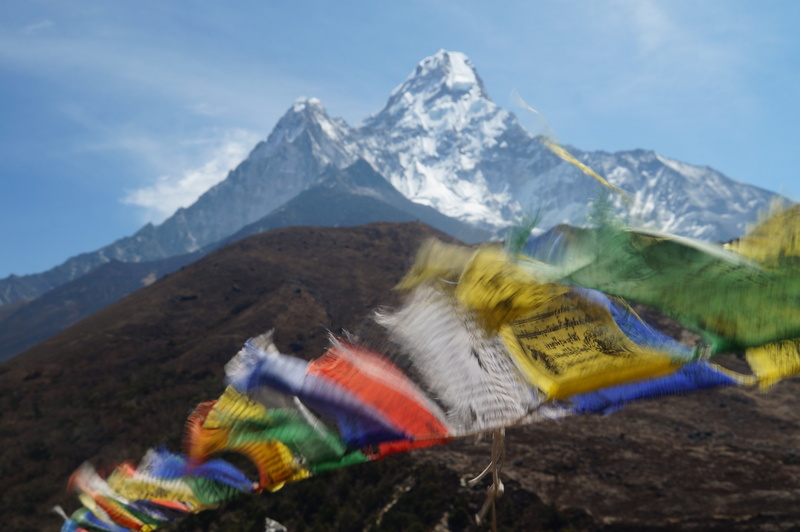 Ama Dablam + Prayer Flags = Pretty! 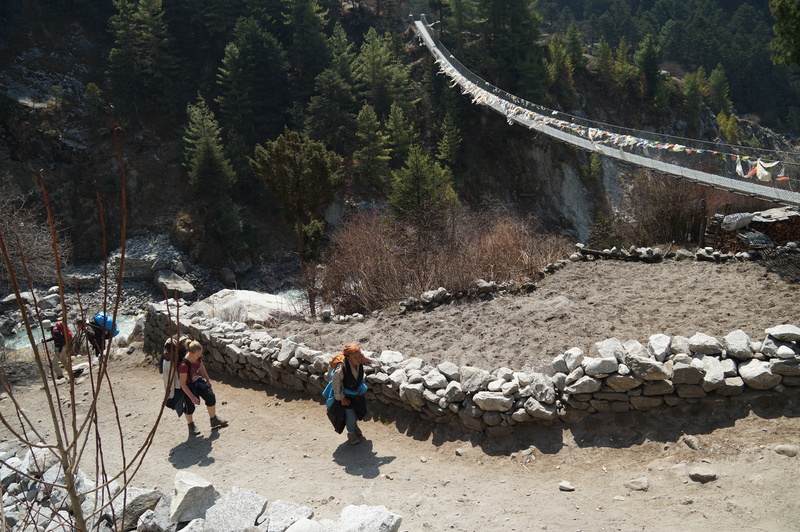 The Imja Khola crossings were gorgeous. Well, maybe not the one where we could see a bridge had collapsed. That really didn’t help with my suspension bridge phobia. How am I supposed to feel safe when I’m confronted with these???? I felt a bit better once we arrived, but go too ambitious, and the short walk through town turned my stomach again and dehydration set in. 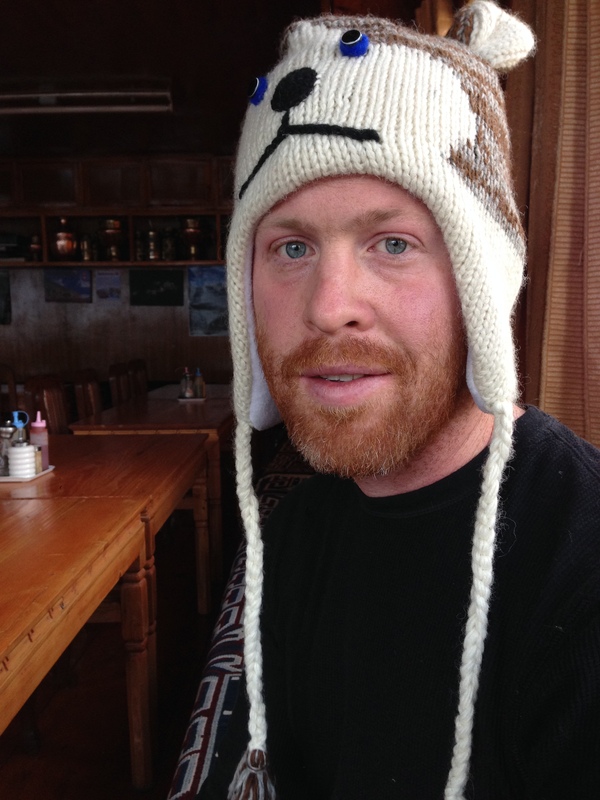 This was terrible timing – our first night over 14,000 feet, and despite the rehydration salts I never recovered. By the end of dinner I had a full blown AMS (Acute Mountain Sickness) headache. Fortunately, it was my only AMS symptom, which made an emergency decent unnecessary. But this meant it was time to break out the diamox and head for bed. The meds let me sleep, but despite drinking another liter of water overnight, the pounding resumed every time I got up. I was nervous about the morning, and terrified I would have to abort my trip. Today was our one and only acclimatization day. Oddly enough, that meant an earlier start than our trekking days. Not that it was an issue – we all seem to rise with the sun around 5:15. I am rewarded with a simultaneous sunrise and moonset on towering Kongde. Gorgeous. I can’t stop taking pictures, even though leaning out the window at 5 am is quite brisk. We set off for the Japanese co-owned Everest View Hotel. If you want to own anything in Nepal, a Nepalese citizen has to own at least 50%. 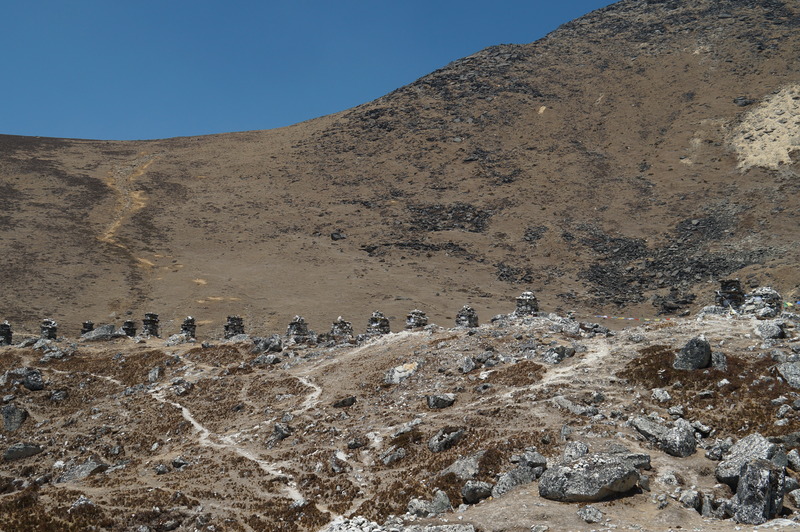 This spot is popular with the Japanese tourists who take a helicopter flight to the Syangboche Airport (3720m), which Karma described as the World’s Highest Airport. It was certainly remote and empty! 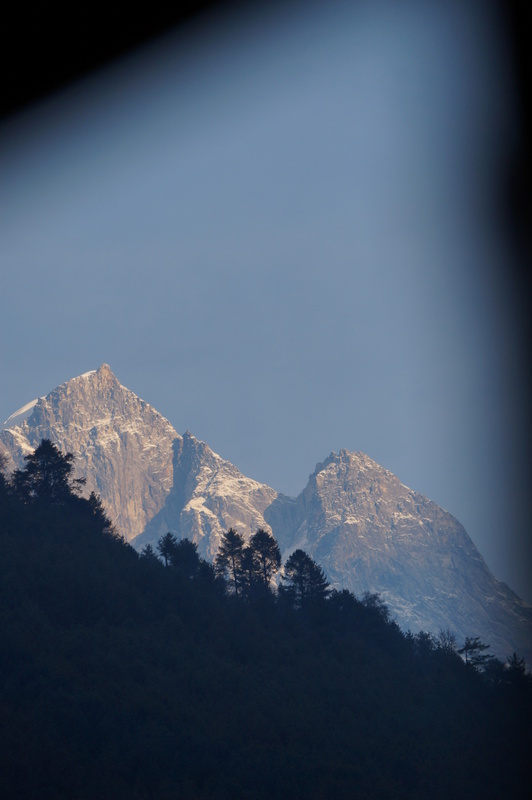 Fifteen minutes before reaching the hotel we are rewarded with our first views of Everest. 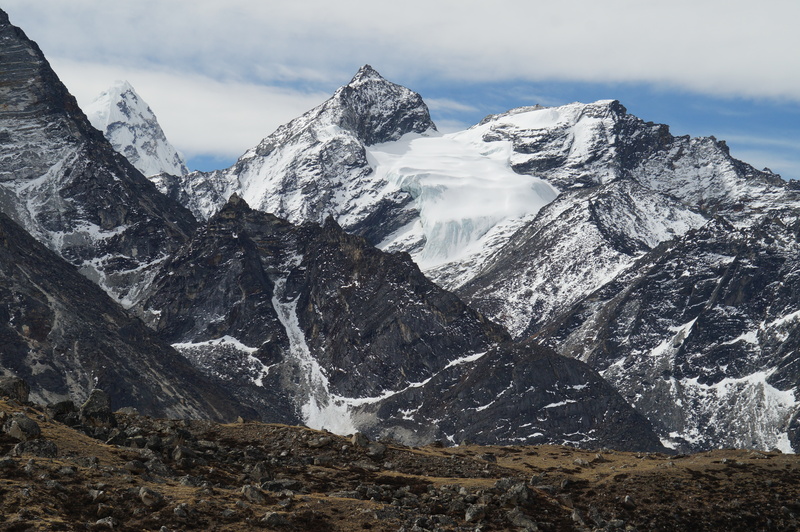 Everest looks tiny and far, hidden between Nuptse and Lhotse. 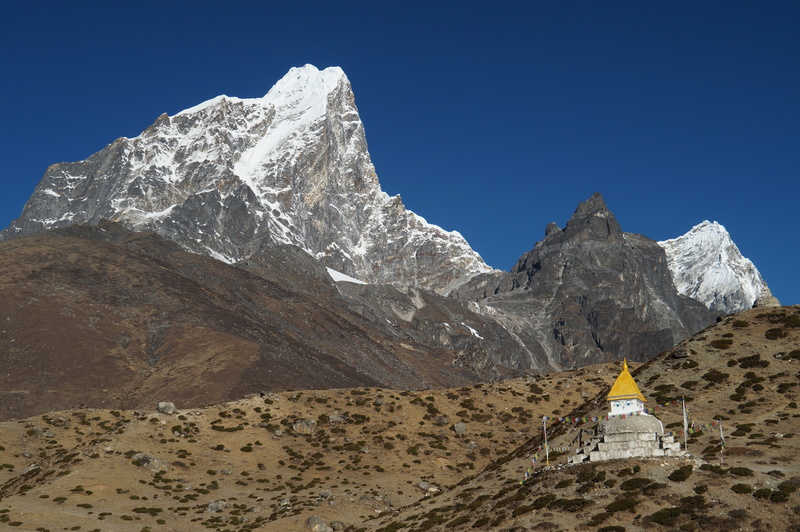 Ama Dablam, the smiling mother reaching out her arms dominated the view, and Shar Tse hid in the back. 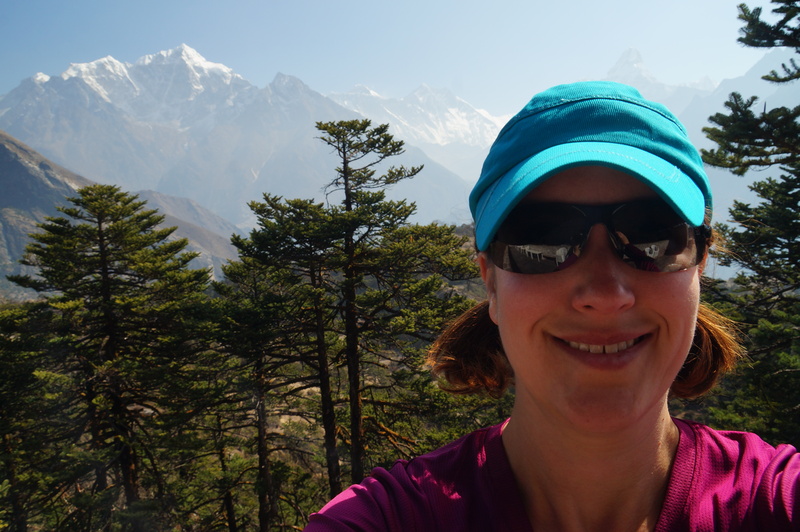 Definitely time for my first trip mandated #EverestSelfie. Our First Glimpse of Everest. All the tourists stop in awe. 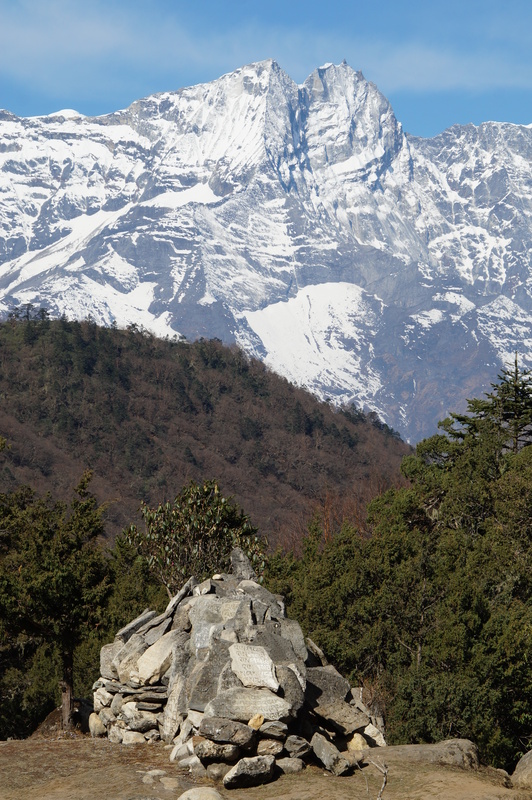 Our views only get better as we arrive at the Everest View Hotel. I note that volleyball seems popular in Nepal – there is a court out front. We head out to the back patio for a leisurely (and expensive!) 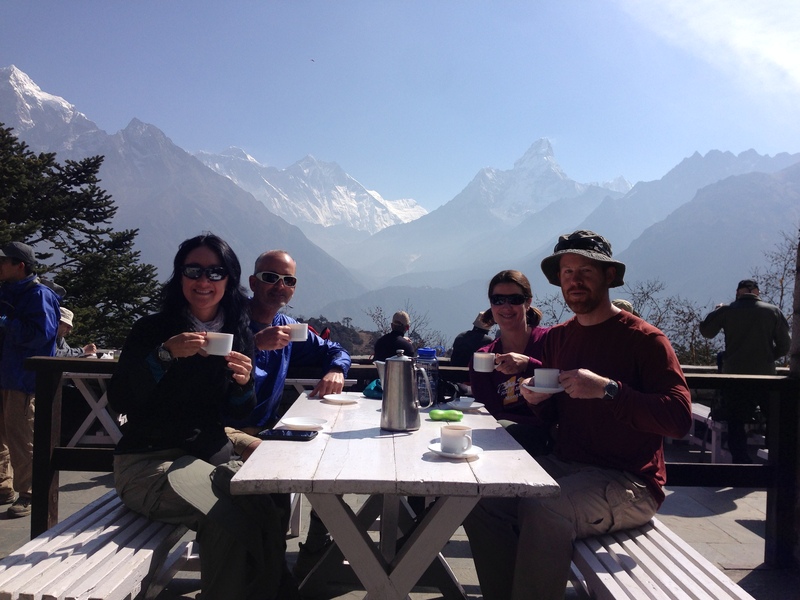 tea break, soaking in the views. I can’t put my camera down or stop staring. 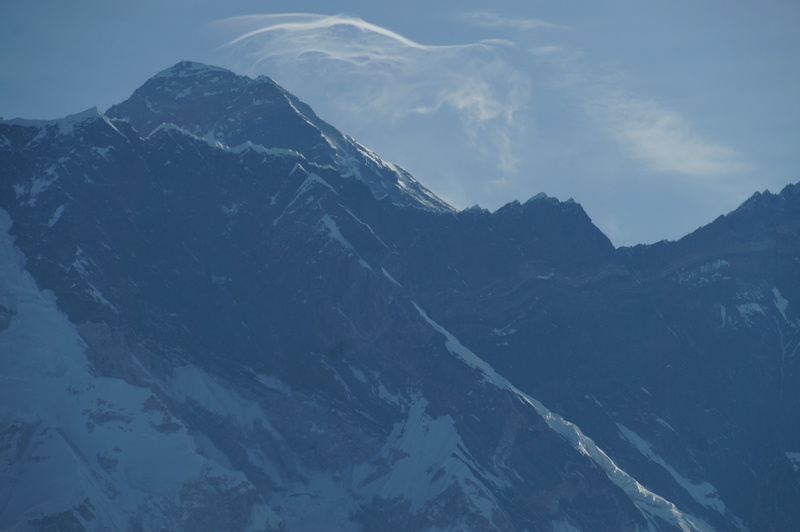 The clouds are starting to come in, and it’s fascinating to watch as the jet stream passes over Everest leaving a stream of snow in its wake. 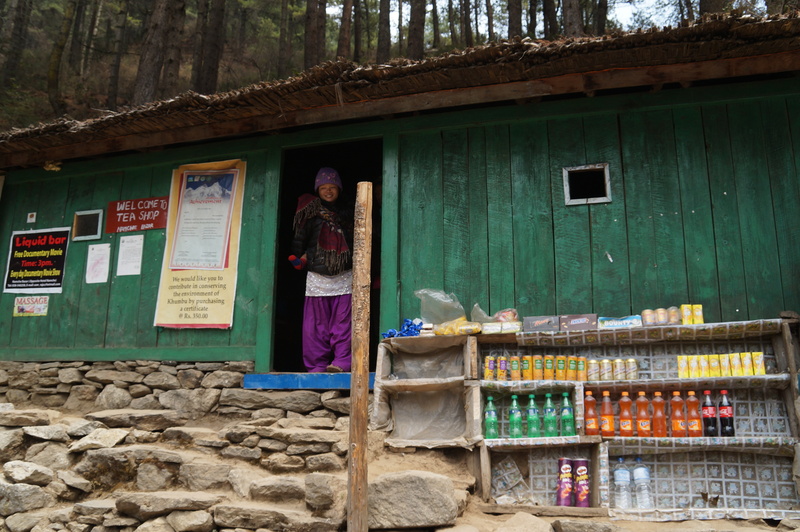 Our next stop is the town of Khumjung. 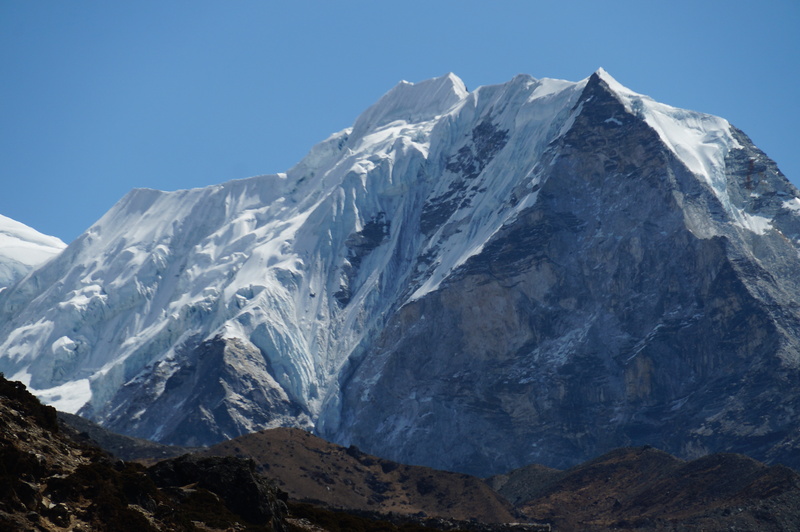 Khumjung is dominated by views of Khumbili (short for Khumbi Yul Lha) – a sacred mountain for the Nepalese and off limits to climbers. 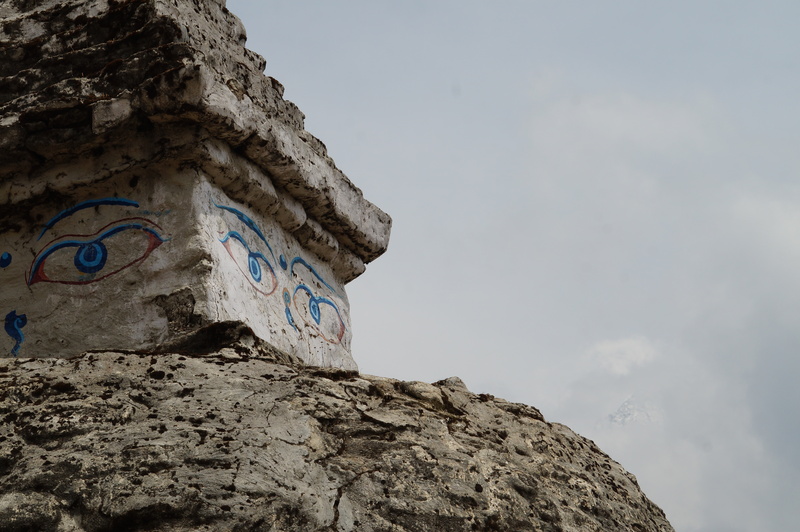 We visit the local gompa and pay 50 rupees to see their famed yeti scalp, suspiciously similar to that of a wild boar. What we couldn’t know is that as were leaving on our walk for the day, an avalanche was racing down just below Camp 1 on Everest. As we leave the monastery, we pass an older woman wailing and crying and covering her ears. A woman we assume is her daughter trails behind, also crying. We now assume that she had received news of the avalanche, and that one of her family members had been a victim. 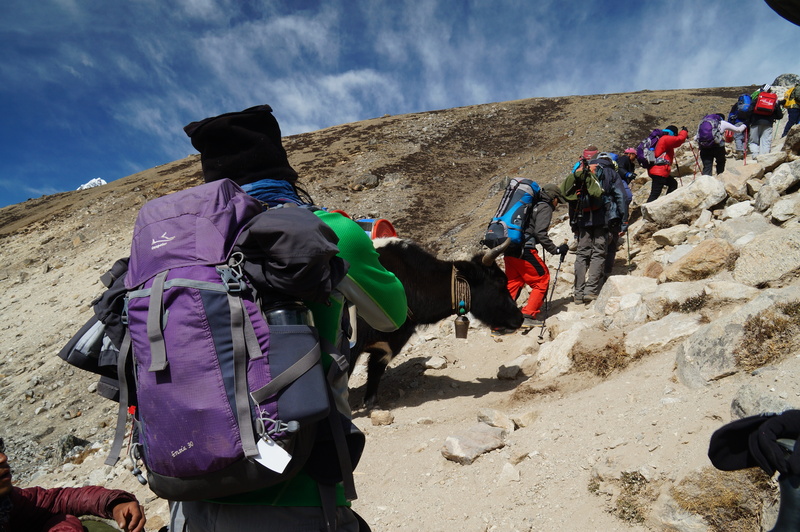 There were several sherpas from the surrounding area. Karma stopped to ask someone what was wrong, but everyone was watching in confusion, unaware of the tragedy that was unfolding on Everest. 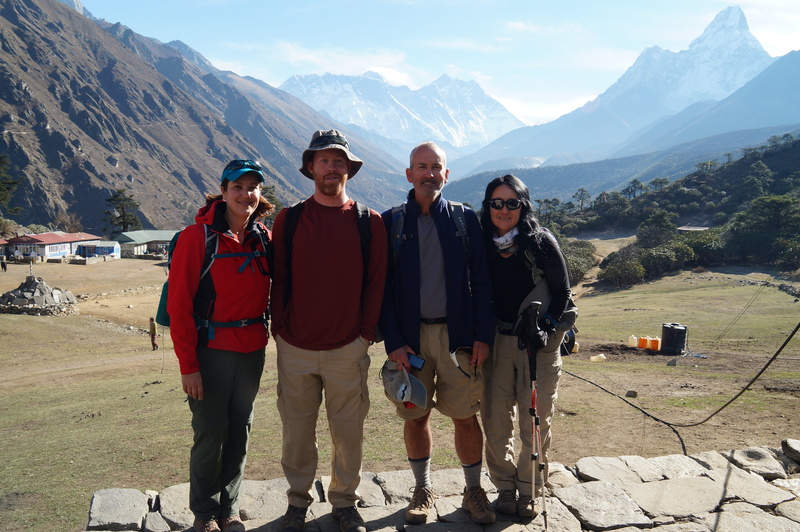 Still unaware of the day’s events, we enjoy the equally beautiful trek back to Namche, with the town laid out before us in a great crescent bowl and snow-capped mountains rising all around it. It’s not until later that night that we find out what happens. I receive several emails asking if I am ok or safe, and ask for the day’s news. The Midnight Lodge owner tells us the story, and we are just left shocked, scouring the internet for information. The number of missing sherpas who move to the deceased list climbs from 9 to 12. Helicopters land nearby with bodies. It’s a bit hard to process. 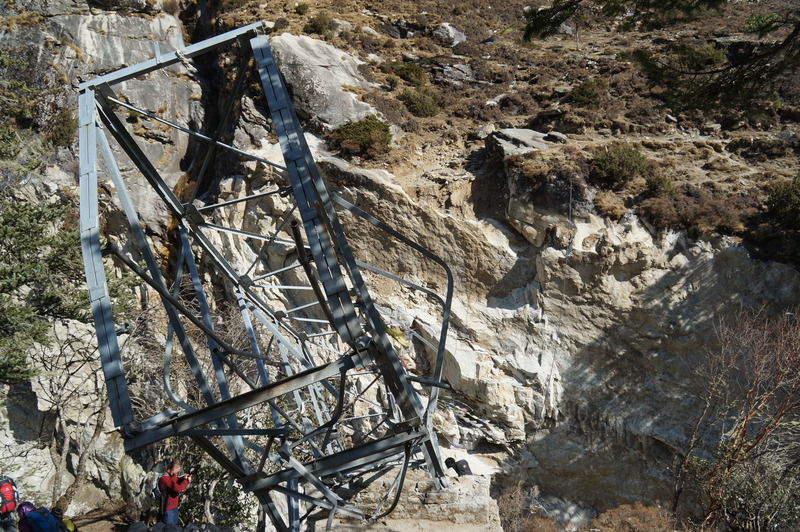 Such a tragedy for the Nepalese who work so far to keep the foreign climbers safe. The single deadliest day on Everest. If you are interested in helping the families of the sherpas who died, the Discovery Channel is endorsing the Sherpa Family Fund through global giving. 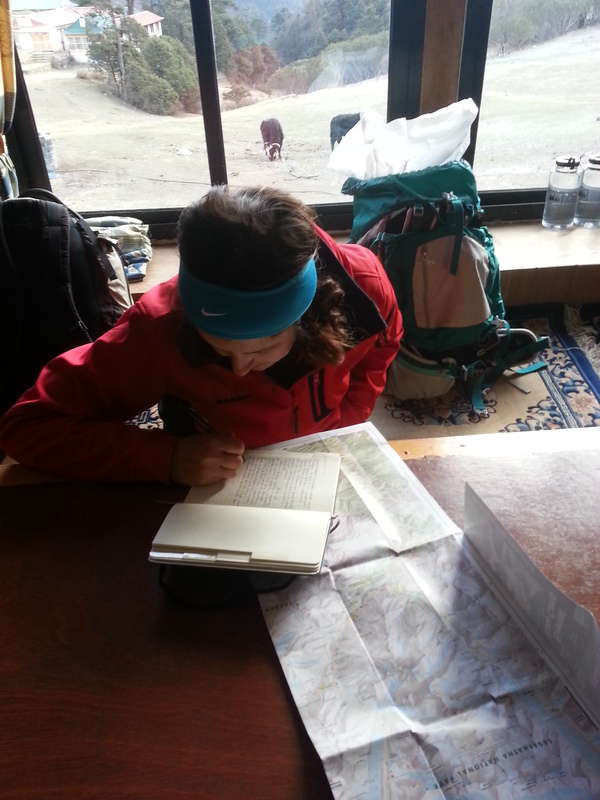 Yesterday afternoon was spent at the lodge repacking our gear, reading and relaxing. We were rewarded this morning with excellent views of snow-capped mountain when we woke up. We all manage to be packed and at breakfast by 7 am, despite the prearranged 7:30 meetup. We feast on fried potatoes with egg. Being allergic to wheat, food options here are very limiting. Potatoes and rice seem to be the only sure bets. Most of the potatoes are either fried or fried but in the more traditional french fry (chips here) format. The upside is that they come in pretty tasty combinations. This particular breakfast included onions, garlic and peppers in addition to the fried egg on top. It proved to be a higher protein option than oatmeal, which was sure to get old fast (it became a trip staple). 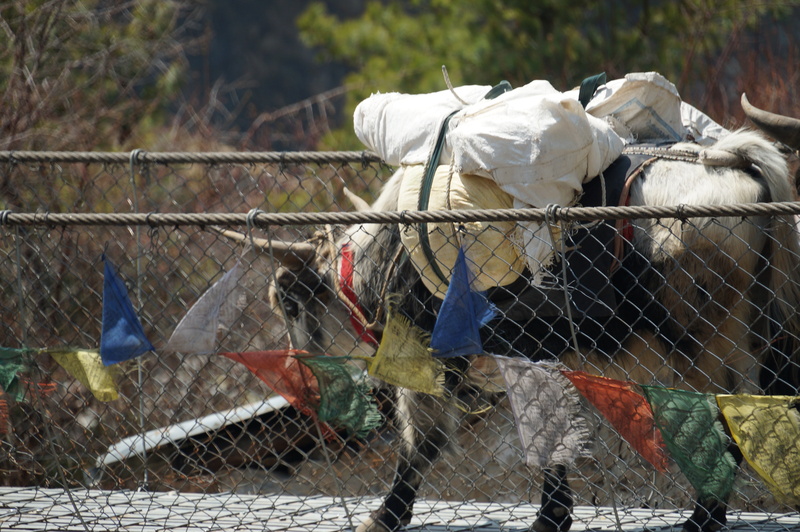 We then set off for Namche. We made excellent time to our lunch spot in Jorsale (aka Thumbug). It probably helped that we didn’t travel over anything steep. That was all waiting for us after lunch – a switchback-filled steep climb. Today’s walk was pretty stunning – multiple river crossings, lots of stairs, and our first good views of the mountains. I’m slow on the steep uphill, keeping an easy pace and taking frequent water breaks. 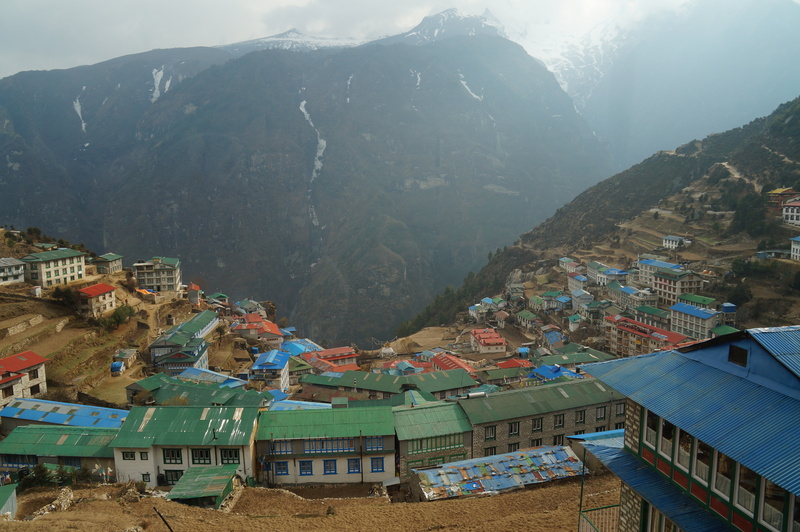 So despite the relatively short mileage, we don’t arrive in Namche until 2 pm. 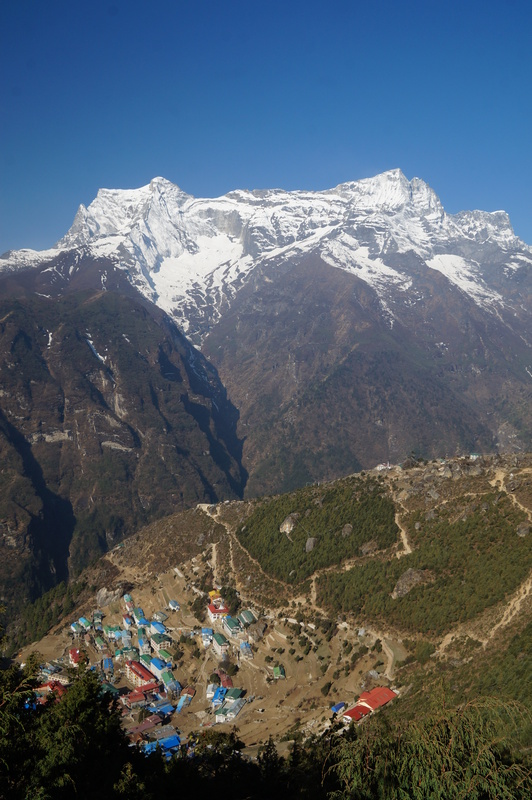 The final climb into Namche is stunning and steep. 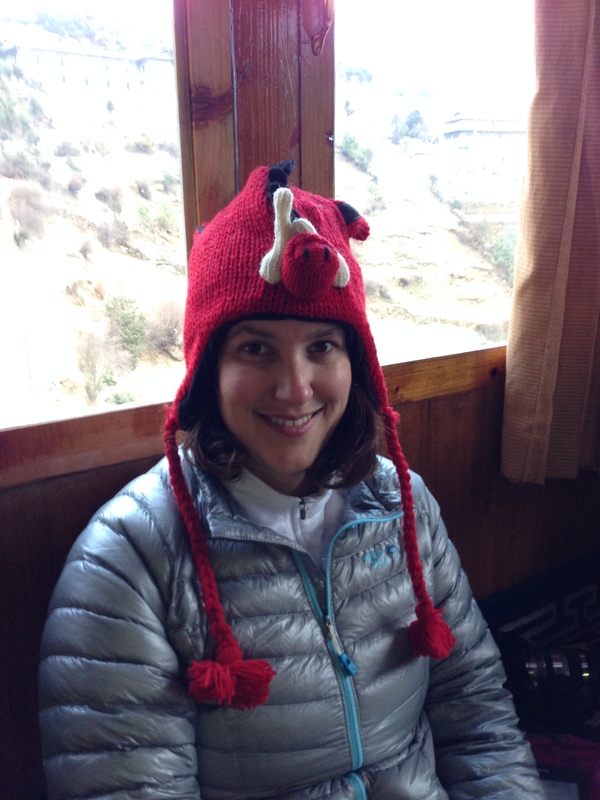 As we start to climb we pass a yak train, and one shoves me aside with its horn. I wonder if it will leave a bruise. It’s certainly a reminder of why you always pass yaks on the inside. It was just enough force that it might have sent me over the edge of the trail if I had been on the outside. It’s not just humans on these bridges! 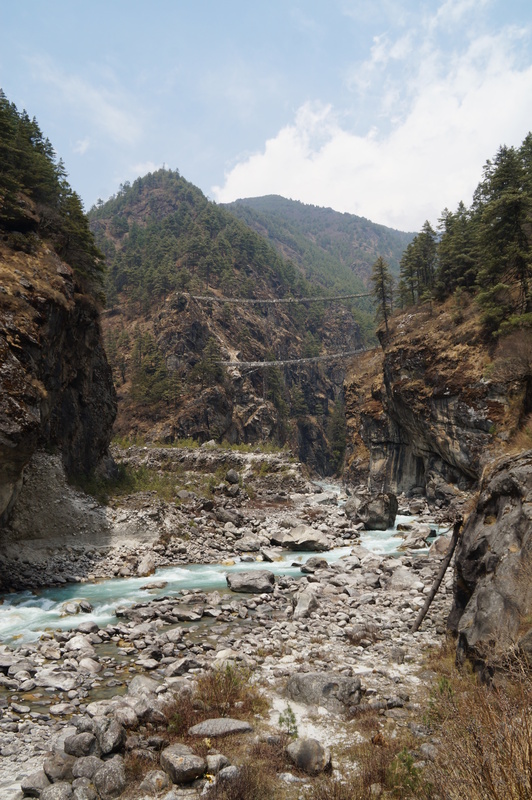 I found the suspension bridges to be terrifying – high above rivers, swaying, yaks and porters in front and behind you, and barely enough space to pass anyone. Couple that with my inability to walk without tripping, and the crossings were rather unsettling. Our first challenge is the high Larja Bridge. I am terrified, far above a river, and all I can manage is to look two steps in front of me, travel quickly while lifting my feet (instead of shuffling, as I am wont to do) and pray. Don’t worry, we crossed the higher bridge. I survive, and now it is up, up, up – hundreds of switchbacking “stairs.” I slow down to accommodate the increasing altitude and ward off the throbbing headaches that sometimes hit me once I’ve crossed 10,000 feet. 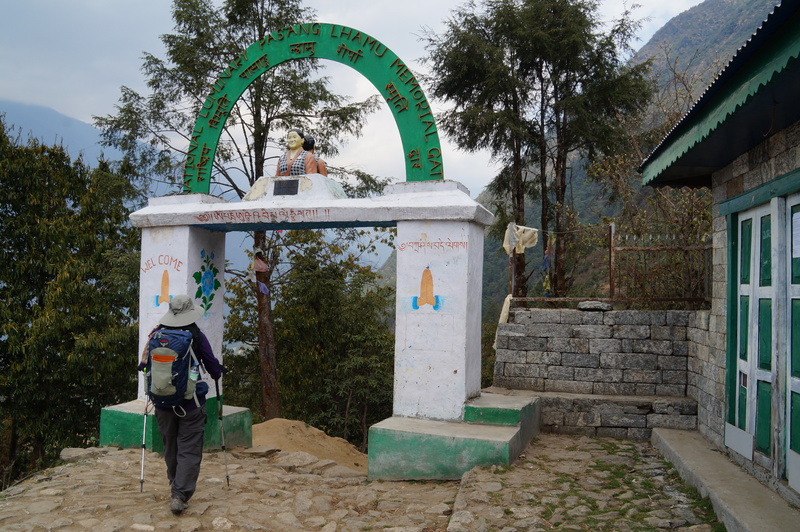 After about two hours we arrive at the Namche checkpost, giving us a false sense of accomplishment. Another 120m of stairs still stands between me and the Moonlight Lodge. Don’t get too excited – 120m to go! 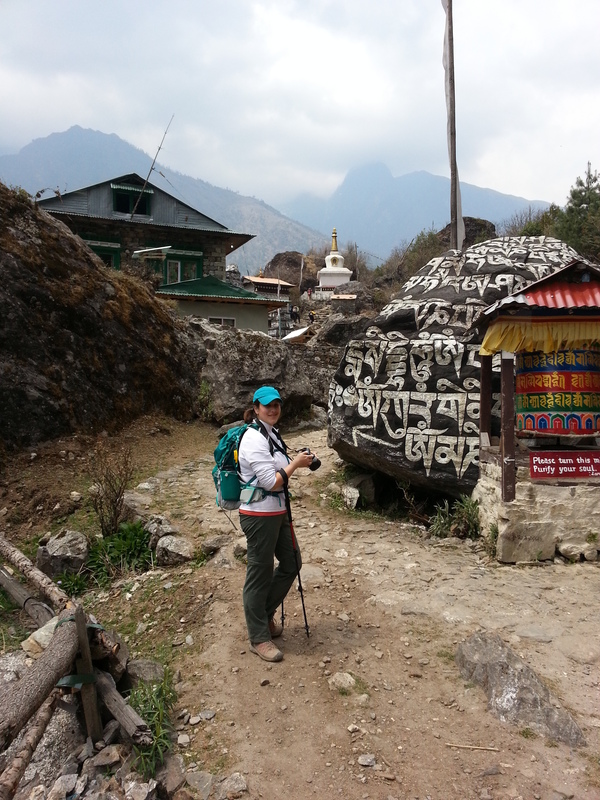 I survive the last of the stairs, and we arrive toward the top of the bowl Namche sits in. The Moonlight Lodge affords us beautiful views, or at least it would if the clouds hadn’t rolled in for the afternoon. We bundle up and enjoy tea and refreshments, writing in our journals (or at least I am) and enjoying what we assume will be our last stop with internet access. It’s a relaxing way to end the day. We are so lazy that we take all of our pictures from the window in the dining area. Why go outside when this is the view from the window? By 4:30 am Wes and I were both awake, and by 5 we were out of bed to shower and pack. We had one gripe about our hotel room: there was an open panel in the bathroom wall, and on our first night we woke up to a bathtub full of rat droppings. Horrified. Night two was more successful – Wes replaced the panel and held it in place with a full bucket of water. No evidence the rats got through! By 6 am we’re packed and ready. Which is good, because Karma arrived to take us to the airport 15 minutes later. We split up into two cabs and made good time despite a minor incident where the luggage fell off the roof rack and into the street. At least we noticed. At the airport the real fun begins. And by fun, I mean more waiting! First wait is for the Sita Air desk to open. Then the security line. Then at the gate. The bus to the plane. Outside the plane while they disembarked the last flight and then loaded us. Logistics do not seem to be something the Nepalese pay attention to. It’s a tiny plane, and a tiny airline. So small that our bus stopped to have our luggage hitched to it on our way to the flight line. 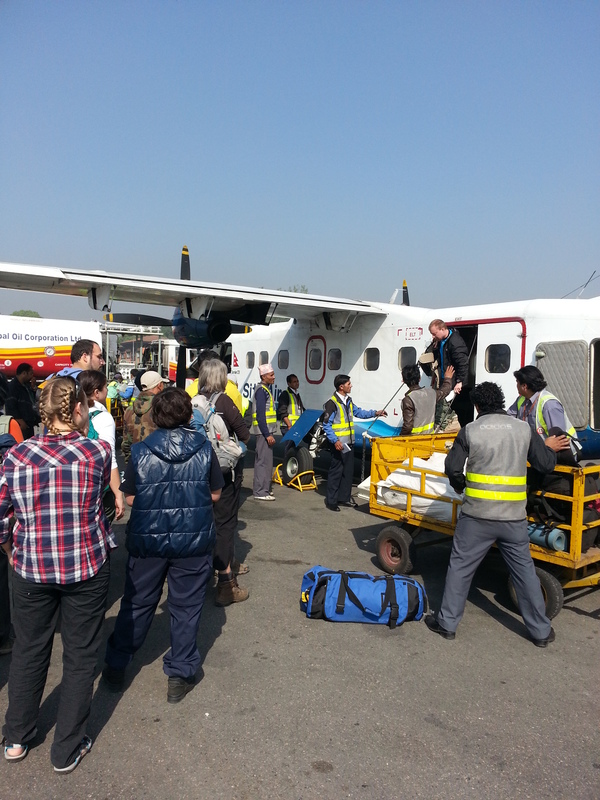 Waiting to board our plane to Lukla. The flight itself is not as terrifying as I was led to believe, although we are pretty close to the ground for the last two passes on approach. True to reports, the runway is short and uphill, with an abrupt turn to the right. But I see the Himalayas for the first time and it is all worth it. 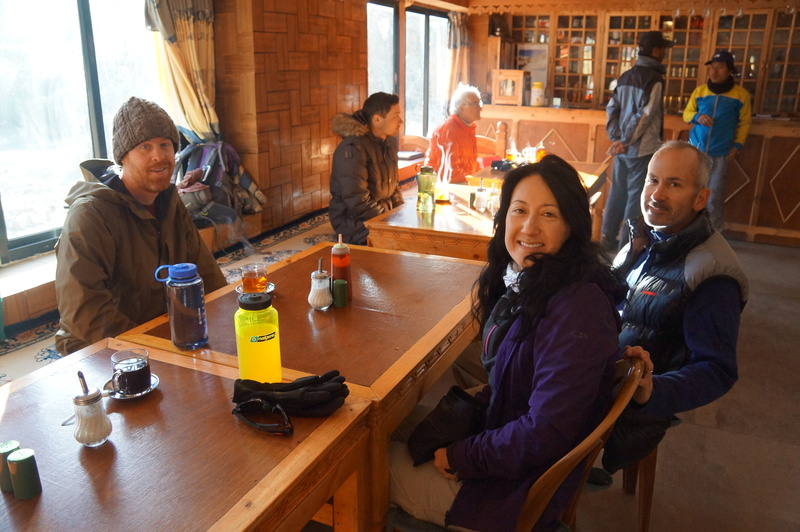 We stop for breakfast in Lukla and get our gear in order so we can start trekking. 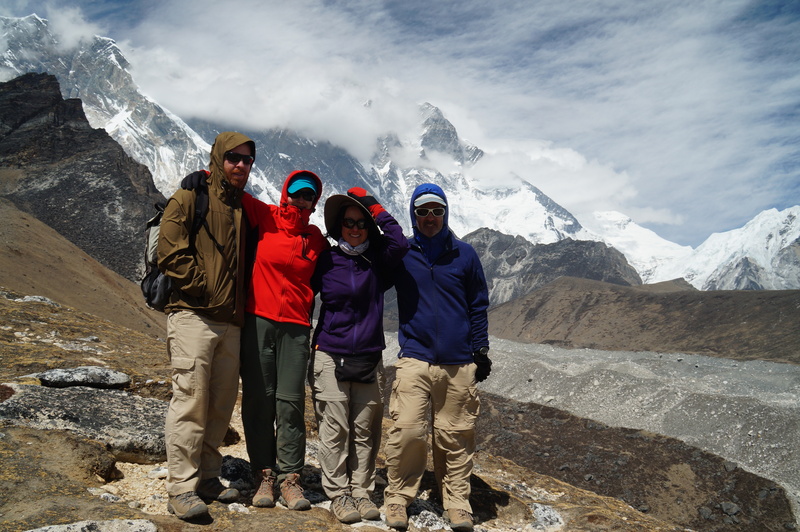 We are joined by 2 porters – Mingma and Razm who will be carrying most of our gear. Which is a relief, because at 2,860m (9,383 ft), the air is noticeably thinner than in Kathmandu. Karma is obviously trying to trick us into thinking this trip will be easy, as our journey involves a pleasant 2-3 hour walk downhill to Phakding (2,610m).